Missouri, the Show-Me State, is famous for its rich history, river towns and wide-open plains. For those wanting to move there, Missouri mortgage rates are a little below average. Missouri counties’ conforming loan limits remain standard, with only slight variation in FHA limits. 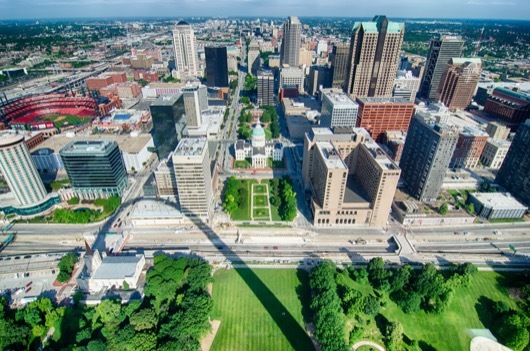 Missouri is home to top-notch colleges and universities, St. Louis and the iconic Gateway Arch and the family-friendly vacation destination, Branson. Grassy plains give way to the Ozark Mountains, and the mighty Mississippi flows near its Illinois border. This Midwest state is average in terms of both size and population. Historically, Missouri mortgage rates have come in equal to or slightly higher than average rates for the rest of the nation. Rates for 2018 so far are just slightly lower than the average U.S. rates. Traditionally, Midwestern states have more affordable real estate prices than homes on the coast; Missouri follows that rule. Every county in the state has a standard conforming loan limit of $453,100. A handful of counties have FHA loan limits of $318,550, which barely squeaks past the nation’s average of $294,515. Those counties are Bates, Caldwell, Cass, Clay, Clinton, Jackson, Lafayette, Platte and Ray. The conforming and FHA loan limits in Missouri is a reflection of the general affordability of homes in the state. Missouri is a deed of trust state. This means when you buy a home in Missouri, the document you sign is a deed of trust instead of a mortgage. The main difference with a deed of trust is that it allows lenders who want to foreclose on a home to bypass the court system when doing so. Instead the lender can initiate a power of sale foreclosure by hiring a third party to auction the home. Missouri has real estate disclosure laws, meaning the seller must disclose what defects they know about the property. Naturally, that’s a positive for buyers. But it’s always best to opt for a home inspection before officially closing on your home to guard against any unexpected surprises once the property is yours. Most homebuyers opt for a 30-year fixed-rate mortgage. This reliable option gives buyers a long period of time to pay off their loan. Because the mortgage rate remains the same for the duration of the loan, the monthly payments hold steady too. You can also consider a 15-year fixed-rate mortgage which allows you to pay off your loan in a shorter period of time and has a lower interest rate, but the drawback of this is that your monthly payments will be higher. The average Missouri mortgage rate for fixed-rate 30-year mortgages is 4.8%. Missouri homes hit right about average with the rest of the country, so the conventional loan limit holds steady at $453,100 in every county. A jumbo loan is any home loan that is higher than that limit. Conforming loan limits exist because issuing a loan beyond that price presents a bigger risk for lenders. As a result, jumbo loans come with higher interest rates to offset that risk. The average jumbo loan rate in Missouri is 4.1%. Another mortgage choice is an adjustable-rate mortgage (ARM). An ARM is a mortgage that does exactly as its name tells you – it has an interest rate that “adjusts” or changes over time. The main attraction of an ARM is that is offers a lower initial interest rate as compared to a fixed-rate mortgage. This low rate is available for one, three, five, seven or 10 years, depending on the loan’s terms. Once that period has come to a close, the interest rate can increase or decrease once a year, though you can usually plan on it going up. The terms of the loan will spell out how many times the rate can change and the highest level that it can jump to. This means that you do know what you are getting into if you select an ARM. It is extremely important to check what that interest rate cap is and make sure that it is one that you can actually afford. The average rate for an ARM in Missouri is 3.4%. Buying a home in Missouri? If you need assistance, here are some of the options that can help you at any step of the process. The Missouri Housing Development Commission offers programs to help homebuyers secure their first home. The MHDC First Place Loan Program provides cash assistance to help first-time homebuyers get a mortgage. The Mortgage Credit Certificate program provides first-time homebuyers who are income eligible with an opportunity to lower the federal income tax owed annually, freeing up some cash to put back into the home. Missouri’s Beyond Housing group has a homeownership center that offers education and counseling to prepare buyers for homeownership, lending services for down payment and closing cost assistance for those who are eligible and foreclosure intervention programs for at-risk homeowners. The United States Department of Agriculture Rural Development program also offers loan help and mortgage grants throughout the entire country. The program is available in more rural areas of a state with the goal of helping with safe, affordable housing for residents. Missouri has grants and loans available for home repairs as well as loan assistance programs for those who qualify. There are no transfer taxes on real estate transactions in Missouri. That means neither the buyer or seller will have to pay this type of tax at closing. Missouri homeowners who itemizes deductions on federal income taxes can double the mortgage interest deduction by applying it to both federal and state income tax filings. Refinancing can help cut thousands of dollars off your overall mortgage. If you’re hoping to refinance your Missouri home, one of your options is the Home Affordable Refinance Program of Missouri. This program grants eligible homeowners access to refinance assistance, interest and principal payment reductions and low closing costs.